Larry Brooks of the NY Post: Mats Zuccarello was sent packing to Dallas. Kevin Hayes could be next out of town with the Calgary Flames, Winnipeg Jets and Boston Bruins believe to have interest. The New York Rangers could be interested in Flames prospects Andrew Mangiapane and Juuso Valimaki. Rangers Chris Kreider knows it’s all part of the business, especially when it comes to pending free agents. If the Rangers are wanting to land a young, top prospect from someone, it might have to cost them Kreider who has a year left on his deal at $4.625 million. The Nashville Predators have Eeli Tolvanen. 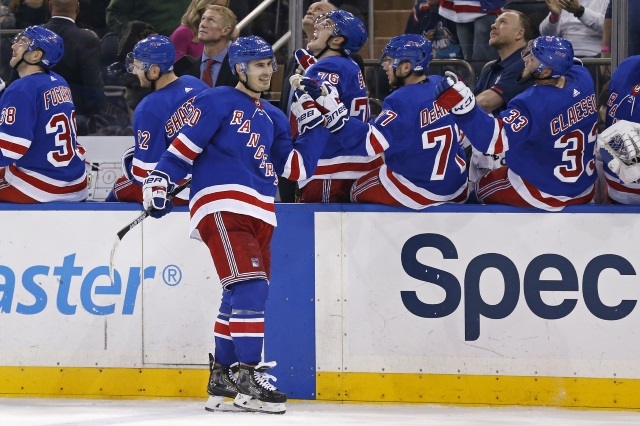 The Toronto Maple Leafs have talked to the Rangers about Kreider. The Rangers are eligible to start contract extension talks on July 1st. They should already know if they’d be willing to do a five- or six-year deal at around $6.25 million. If the Rangers are not willing to commit to something like that, they need to trade him now or at the draft. New York Islanders: More forwards, more forwards, more forwards!